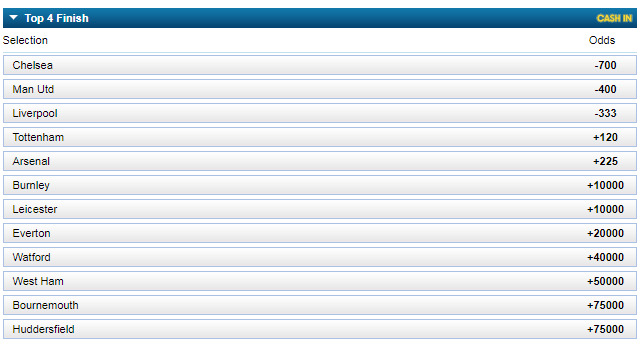 William Hill Canada is offering several English Premier League futures that we hope to turn into end of season profits. So let's start at the bottom with the always intriguing relegation fight. Let's call it what it is. And there are three losers every year who will go down to the second division and lose out on what has become a huge payday. The rest of these sub-par franchises will cash in and probably still be awful next season as well. For starters, I am going to rule out all of this season's newly promoted sides. Newcastle, Brighton and Huddersfield have shown enough from a quality and survival standpoint to stick around for at least one more season so let's keep them IN. Next let's go ahead a lock Swansea (-400) in as one of the relegated teams. They sold their best players and purchased no one good in return. They have the second worst shooting percentage, have produced the lowest amounts of scoring chances, shots, shots on goal and goals scored this season, and will likely add no one in the January transfer window who can turn this around. Their chances of survival are slim to none and slim just left the building. As a betting proposition you have a very good shot at a 25% return on your money in 4 months, so sell some of your bitcoin and invest here. Bournemouth (+300) may offer sneaky value. Their horrendous home record has put them in the conversation, but there should be some regression to the mean over the second half of the season. No game on their schedule looks easy but Callum Wilson, a very good striker, has returned from a long term injury and adding him to the team is essentially like acquiring a star in the January transfer window. They'll survive but not by much. Crystal Palace (+600) are easily the hottest team of this group having claimed 11 points from their last 6 games. They have been the closest of any team in England to beating Manchester City and of all the teams mentioned in the relegation scrap, they have the only world class player in Wilfried Zaha. Frankly, that will be enough for them to stick around. West Ham (+700) have the next best record after Palace over their last 6 going 2-3-1. Furthermore 7 of their next 8 games are very winnable making them a favorite to stay up. +700 may be way higher in a few weeks so if you were going to bet this wait as you may get a better price in the middle of March when their schedule becomes hard. But by then they could be safe from demotion. West Brom (-150) have some troubling tendencies. They are the worst team in the Premier league at possession, and shooting accuracy yet have made the fewest defensive errors (3) of any team as well. Their best shot is to nil-nil their way out of 19th place. Whether Alan Pardew can do it or not is irrelevant to me however as this line does not offer the value I am looking for. Both teams are a mess defensively. Stoke have conceded 47 goals this season, 7 more than any other team and Southampton (19) have committed more defensive errors than any team. Southampton last won a Premier League game in November, they just sold their best defender for a huge fee and the one player on their squad who looked like he could single-handedly keep them in the top flight, Stone Cold Charlie Austin, is now on the shelf for an extended period with a hamstring injury. Their easy schedule is what favors them with only 5 games left against top sides and the remaining 13 being the ones they can put all their eggs into. But seeing as how they haven't been winning these winnable games anyway what switch can they flick to make it suddenly start happening? For Stoke this has been a long time coming. They have maintained a habit for the last decade of winning enough points to stay up and then mailing it in. When that's the corporate culture you exist in it's only a matter of time before underperforming becomes your regular modus operandi. One of these sides is going down - Bank on it. So the question then becomes, does Liverpool blow it. And if so, to whom. The argument for Liverpool to blow it is not a strong one. They have a very, very easy schedule. They create the most chances per game of any team, have scored the 2nd most goals and just upgraded one of their worst positions, central defense, with Virgil Van Djik. Adam Lallana's return will cushion the blow of selling Coutinho to Barcelona. And contrary to popular belief they don't create as many defensive errors as you'd think. They have committed just as many as Tottenham have (10) and Arsenal have committed almost double (18). Seeing as how these are the two likely candidates to oust them I like their chances to hold them off. Tottenham have a slightly harder road in both the Champions League and the Premier League. In a few weeks they play Manchester United, at Liverpool, Arsenal and at Juventus over a 14 day span. Arsenal also have an easy go schedule wise but may be on the verge of selling their best player in Alexis Sanchez. Though they may play mostly reserves in their Thursday Europa League games Arsene Wenger may wind up being forced to take that competition more seriously as it appears more and more that winning it may be most likely way his side will be in the Champions League next season. The race for second place looks more interesting to me than anything else! If you haven't been paying attention Manchester United and Chelsea managers Jose Mourinho and Antonio Conte have entered into the arena of verbal nuclear warfare. They may be so consumed with one another that Liverpool (+300) could conceivably take 2nd place from both of them. Chelsea do not have the deepest squad and both them and United have been putting in some uninspiring performances as of late. On average Liverpool create 3 more scoring chances per game than Manchester United. Liverpool have outscored Chelsea 50 to 41 in the premier league this season yet create less than 1 chance more on a per game basis. There is a clear path for them to 2nd place particularly if these trends continue.